A day in the life…what’s it like here? I know everyone thinks we sit around sipping Mai Tai’s off the back of the boat all day but I’m here to dispel that myth.We’re just being the same Us we were in Canada only here…sort of. When we find ourselves between charters we tend to vagabond about. Wherever the wind blows or if there’s something going on somewhere we may, or may not show up. 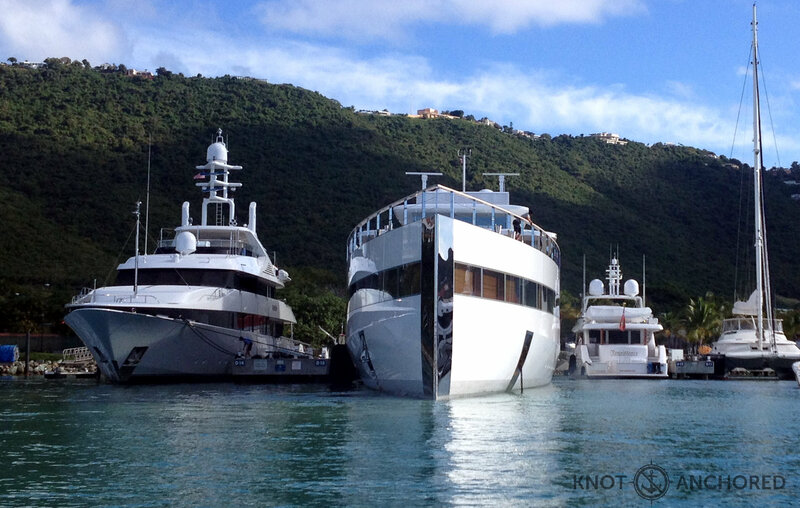 BUT when we are in a port that has shopping nearby we SHOP cause you only have so much stuff in stock on the boat. 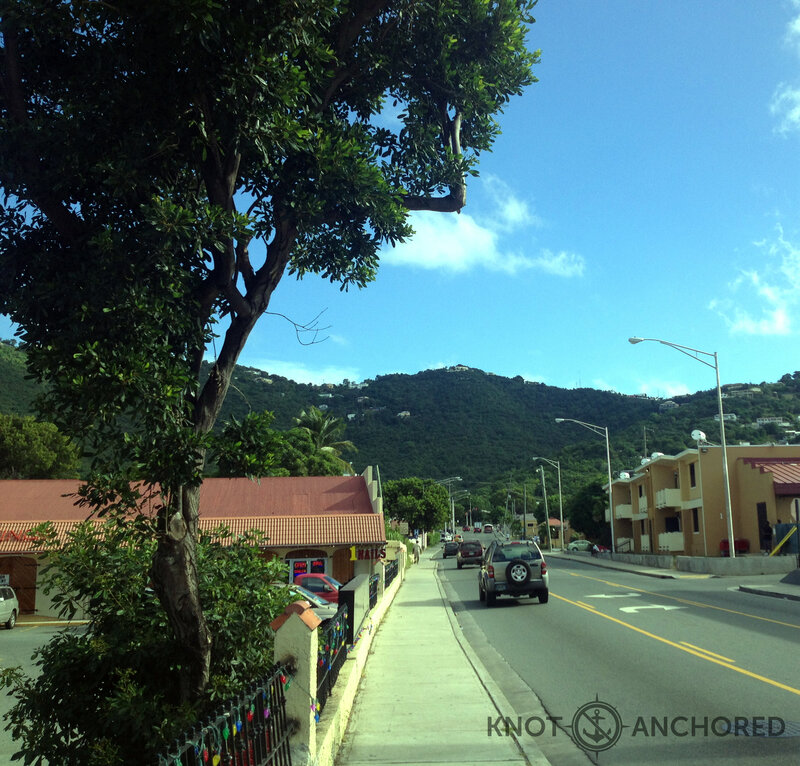 This particular day we found ourselves in Charlotte Amalie. CA is the main port where all the big cruise ships dock. 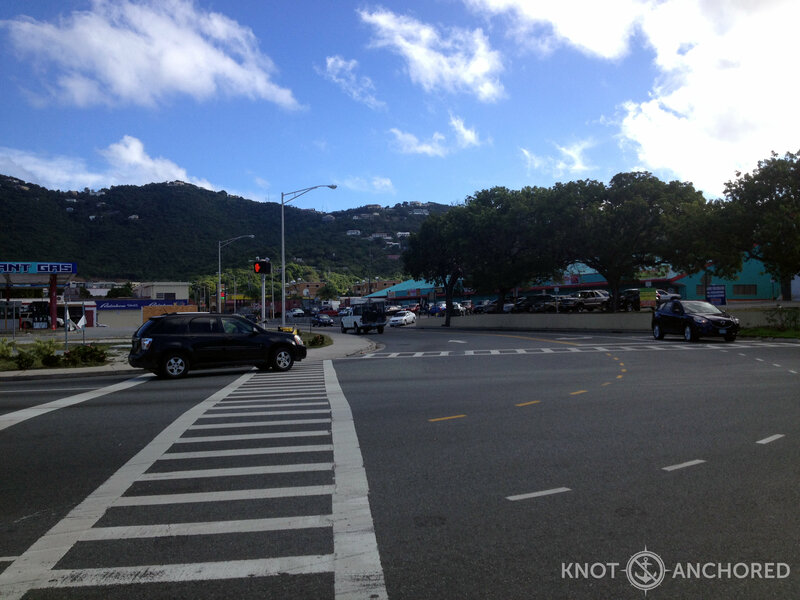 Unleash traffic chaos onto St Thomas. So here we are in the dinghy, early morning, heading to town to shop. This is the Apple boat. As in iPhone. Story goes that Steve Jobs commissioned a designer to create this masterpiece. Unfortunately he passed away before the boat was done. The dealer was to get 10% of the final cost of the boat. 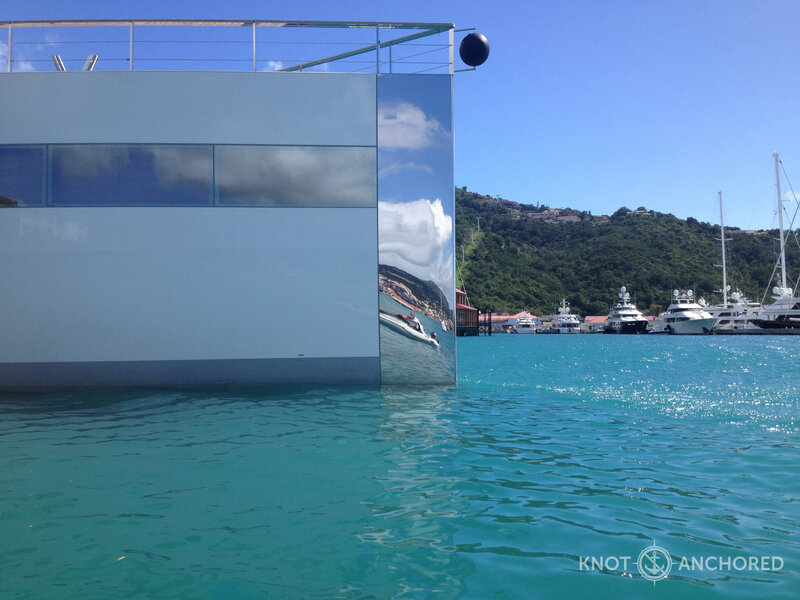 The boat cost 150 MILLION EUROS. Job’s family sent the guy a gold iPad, it didn’t go over well. The boat was seized in waters somewhere until the agreement was fulfilled. 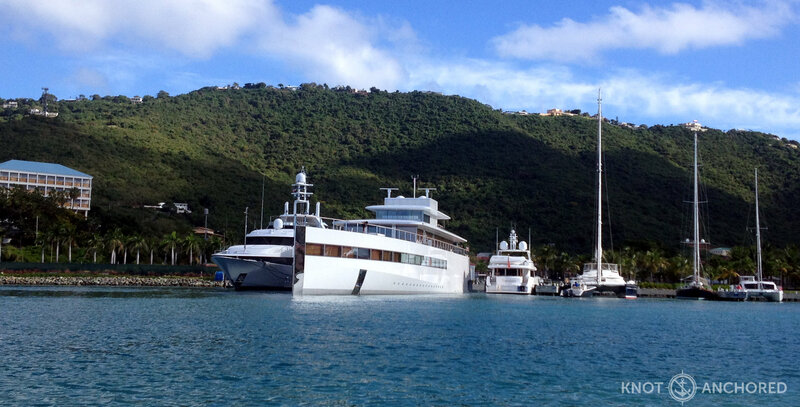 And here it is in Charlotte Amalie. Which is going to make the rest of this article seem very not interesting! 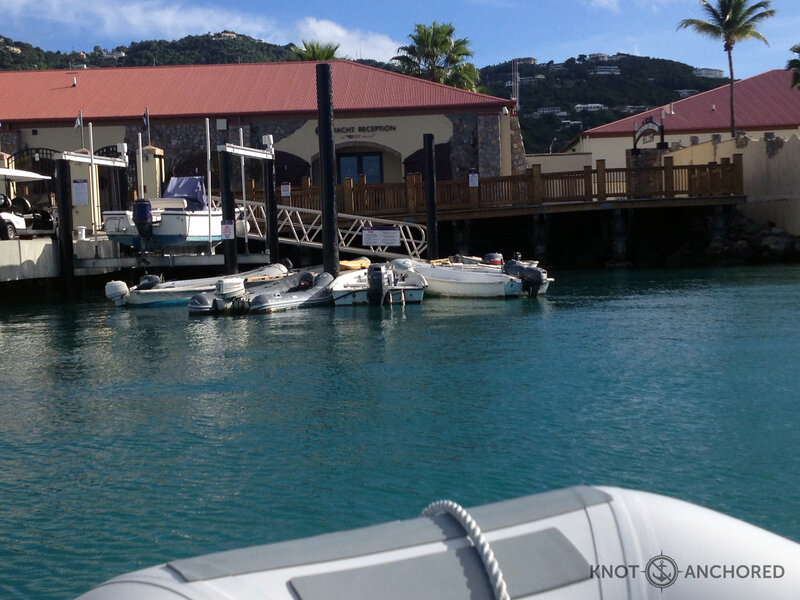 Ok back on track, this is our parking lot – the American Yacht Club’s dinghy dock. This is the street we walk down with all our environmentally friendly shopping bags. This is a special cross road for us because the lights are more of a SUGGESTION rather than a rule. We take this corner very seriously. 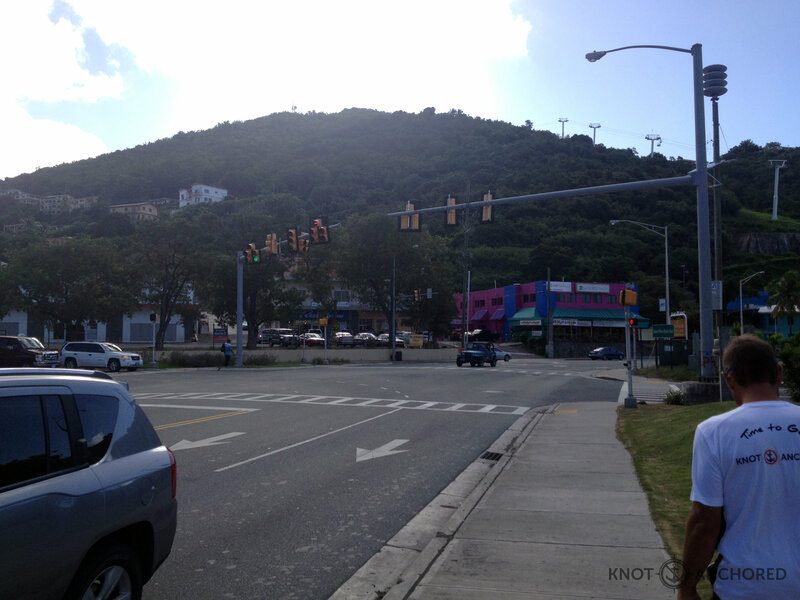 Up this hill we go to the Little Kmart, get some stuff but not nearly everything we need (that’s another post). The plaza to the left is where Stevo gets a seriously cool straight razor shave at Hombres. All business except for the 4 big screens streaming every sport going and the bar in the back with the pool table and slot machines…seriously! They do an INCREDIBLE job here. Well thanks for hangin in there this long…I know it was boring but here we are back at the Apple boat. 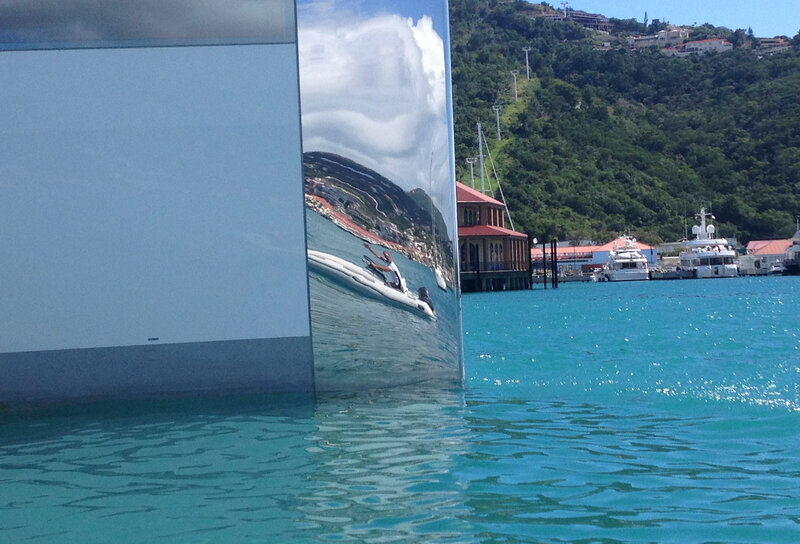 Yes that’s our reflection in the chrome…look closely! 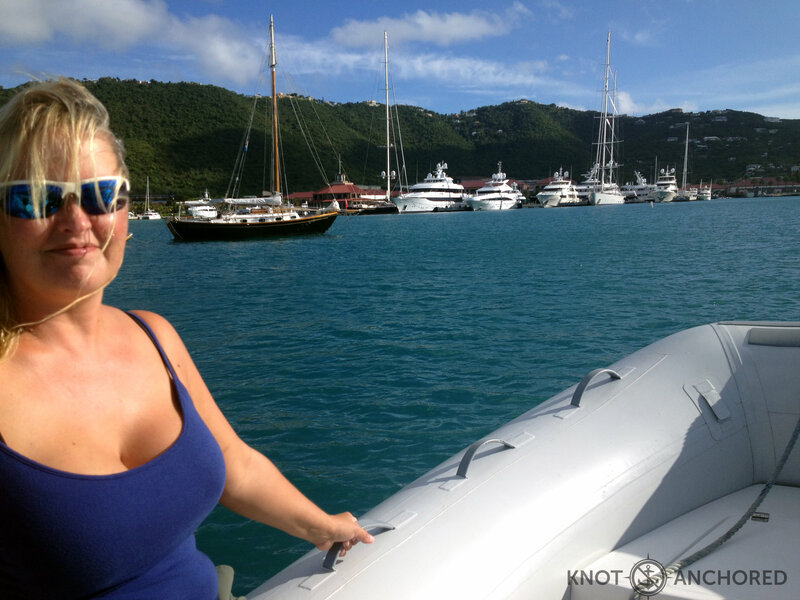 Next Whales on the Anegada Passage!! 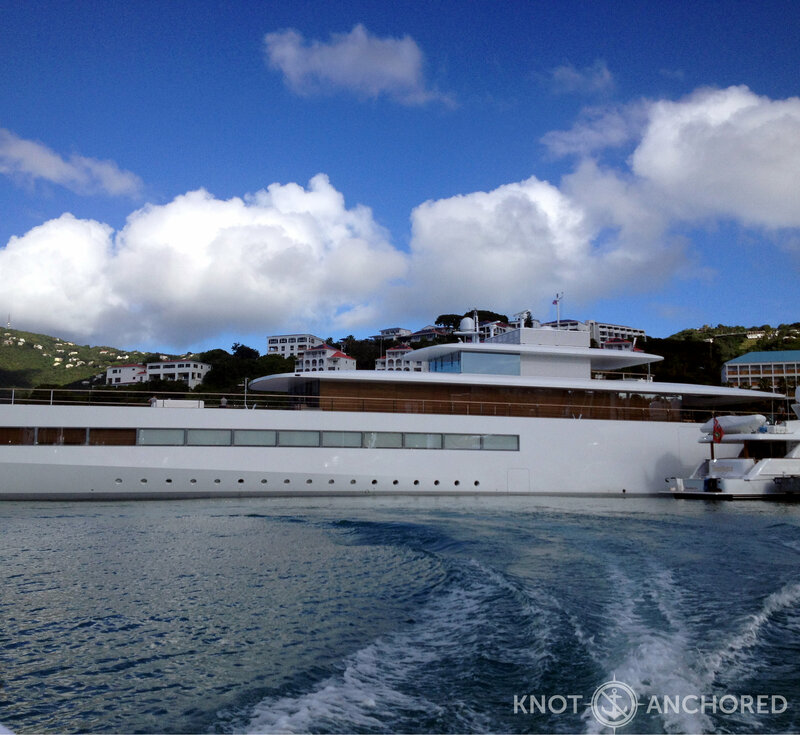 Cool Apple boat but not as valuable as that new tender your commandeering ! Your myth busting isn’t working Chris! Yep, gorgeous boat, that Apple thing.